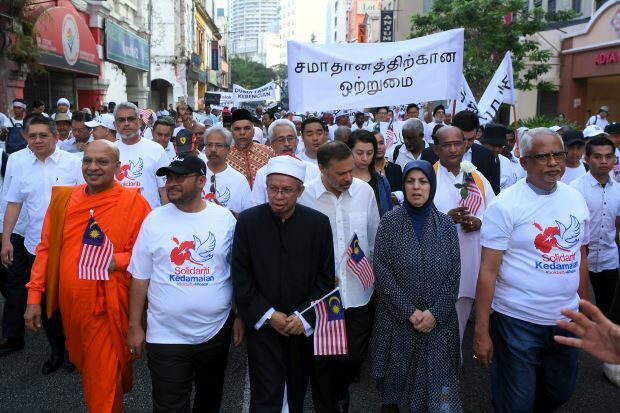 Kuala Lumpur (AsiaNews/Agencies) – People from various religious and ethnic backgrounds, including Sikhs, Taoists, Christians, Hindus and Muslims, took to the streets of Malaysia’s capital Kuala Lumpur in a march to promote peace and express solidarity for the 50 victims of the terrorist attack on the mosques in Christchurch, New Zealand. During the rally, organisers and government officials read out a five-point peace declaration. In it, they condemn all acts of discrimination, violence and killing in the name of religion or ethnicity; reject any act or culture based on hatred in the name of religion or ethnicity; voice support for all efforts to foster peace and promote harmony among people of all ethnicities and religions; defend Malaysia’s Federal Constitution and the country’s sovereignty against agents of racial and religious hatred. ; and express solidarity with the citizens of the world to develop an environment of peace and prosperity based on the recognition of different ethnicities and religions. Participants in Saturday's rally, mostly clad in white T-shirts, met in front of a shopping mall in the heart of the city as early as 6.30 am, before marching towards Merdeka (Independence) Square about 1 kilometre away, carrying Malaysian flags and banners with peace messages. Members of the Malaysian government, including Islamic Affairs Minister Datuk Seri Dr Mujahid Yusof Rawa, took part in the event. "The world must be defended from any act of terror. The tragedy in Christchurch was a shocking incident when there are so many movements in this world fighting to promote peace," Mr Mujahid said. "The act of terror in New Zealand cannot be associated with any religion or any race in this world. Terrorism is not born from any religion; no race was born with hatred... Terrorism has no face. Therefore, our declaration today condemns any act of discrimination, violence and killing in the name of religion or ethnicity."